Swimming is an excellent form of exercise and physical activity necessary for a child’s development from the viewpoint of muscles, structure and cognitive and also complements children’s education. The most important thing in the infant stage is for children to have fun while they are carrying out any activity, the fun component is important while they carry out different learning and development tasks, in this way they associate the swimming-pool as a fun, trustworthy place. Infant swimming is one of the most complete sports. In this activity they work and exercise muscles, motor coordination and their breathing and circulatory systems. Moreover it contributes towards the development of independence and the self-confidence of the child. It is an activity which encourages being sociable with other children while practicing sport within a team, comradeship and discipline are established. The leaders of the activity set objectives for the child from a fun, therapeutical perspective, in this way they encourage perseverance and effort to achieve their objective. Children who get used to water at an early age and develop great confidence and self-esteem in this environment. Thus it is possible to avoid fears and phobias. 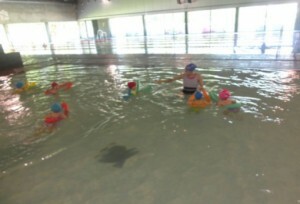 The general objective is to offer aquatic activities with an educational, leisure and health purpose, learning in this way basic and specific motor skills within an aquatic environment (developing aerobic ability, developing motor skills, the ability to float, improvement in coordination, balance and knowledge of the environment).